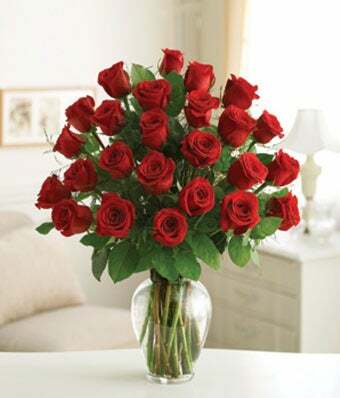 Send a beautiful expression of love with a florist arranged two dozen fresh roses. An elegant bouquet of two dozen long-stem red roses, expertly designed by our florists with fresh greens. Arranged in a tasteful clear glass vase; vase measures 11"H. Make a love statement by sending twenty four roses all in one bouquet.